Getting that pre-baby body back can be a challenge. Finding the time and organizing a sitter complicate matters even more. But what if baby joins in on the fun, too? Pittsburgh moms can find plenty of options for workouts that allow babies to be part of the fitness regime. These workouts stimulate baby with eye-to-eye contact and movement while keeping mom sane in a supportive group environment. Babies enjoy fresh air and keep eye contact with moms during this Fit4Mom class. A national organization, Fit4Mom guides women through each phase of motherhood, from prenatal and postpartum to beyond. Fit4Mom Bethel Park offers workouts at the South Park Oval and Bethel Park Community Center. Across town, Fit4Mom North Hills gathers near the North Park Boathouse and at the Block Northway. These workouts get your body moving while keeping baby entertained with bubbles and songs. Classes include Stroller Strides, where moms focus on cardio and strength training with resistance bands. 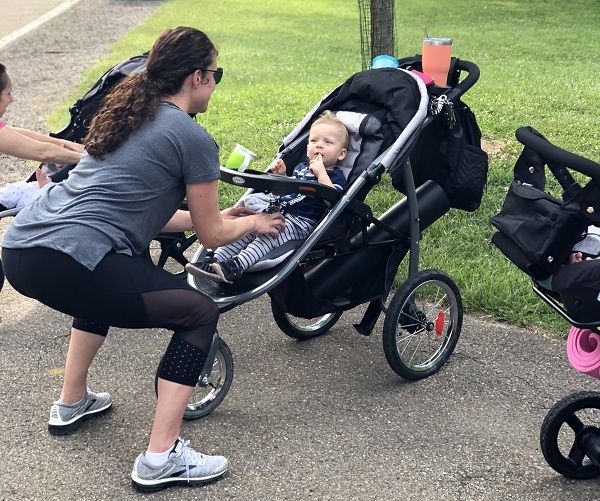 At Stroller Barre classes, the stroller is utilized for traditional barre stretches and Pilates-inspired conditioning, along with cardio exercise. The Strides 360 class focuses on cardio to build speed and agility. 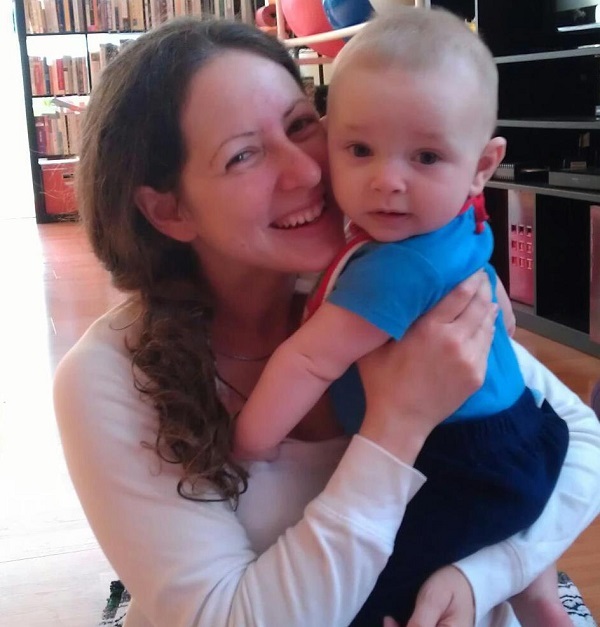 Moms with little ones from 6 weeks to 6 years find a kinship with other supportive moms. They often spend time together after their workouts, says Cortney Sweeney, owner and instructor of the Bethel Park location. “We call it our village,” she says. Babies have fun while helping moms work their bodies at Schoolhouse Yoga. Yoga instructor Kara Kernan will offer to rock your baby to sleep or build a tower of yoga blocks with your toddler so you can get a moment to stretch and breathe. “Mommy and Me” sessions at Schoolhouse Yoga are all about mom, she says. Unlike a typical yoga class, sometimes crying babies compete with the final resting pose of savasana. The classes, held in East Liberty and Squirrel Hill, focus on breathing and stretching. Babies contribute in a positive way to the workout, too. Your baby can lay across your stomach during the bridge pose or relax on your hip during Warrior II. But if baby is happily sleeping, mom can work out solo. Leah and Simon enjoy a moment at Shining Light Prenatal’s yoga class. If you’re looking to stretch and strengthen your body and get to know other new moms, Shining Light Prenatal‘s “Mommy and Me Yoga” class is a fine choice. The weekly class in Millvale is geared for moms with babies from 6 weeks to 18 months of age. The class focuses on appropriate postpartum core work that’s reasonably paced, says Deena Blumenfeld, owner and principal educator. The goal with each move is to restore your body’s integrity to its pre-baby fitness level. Another plus: The class builds a sense of community with other moms, who hang out after class and share stories. But why stop there? Mom’s entire support group – Dad, baby’s siblings and Grandma – can get involved with a monthly family yoga class. Babies can add to the joy of working out together at Yoga Innovations. Yoga Innovation understands the unpredictability of babies, so its “Mommy and Me” class takes an “everything goes” attitude. The class incorporates babies and toddlers as much or as little as they are inclined to participate. Need to pause to nurse? No problem. Is peek-a-boo required to keep baby happy? 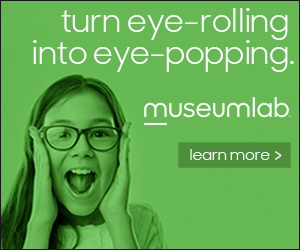 That’s cool, too. The Bethel Park studio space also includes space for toys for busy toddlers in its relaxed atmosphere. 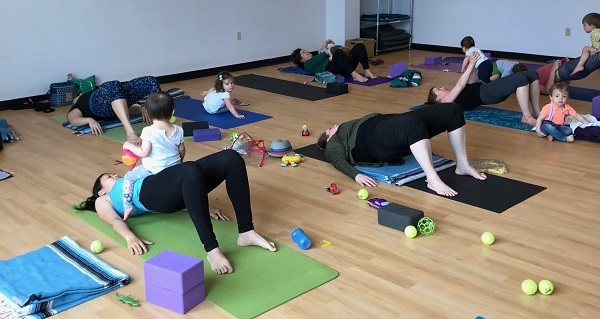 New and nursing moms can ease their way back into workouts with the “Mommy and Baby Yoga” class offered by Kids+ Pediatrics at The Well@Kids Plus Squirrel Hill/Greenfield location. The class is tailored for new moms and babies up to 15 months. Traditional yoga poses are adapted to involve babies in the exercise. It’s a fine way for moms to ease themselves back into their fitness routine without hunting for a sitter. 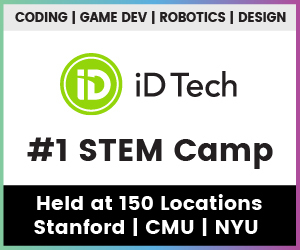 A win-win all around! Zumbini classes draw from its Zumba beginnings to create a high-energy activity for both caregivers and babies. Moms who love the exuberant energy of Zumba will want to give Zumbini a try. The creative minds of Zumba and BabyFirst created this program for moms and their little ones from birth to 4 years old. Zumbini combines dance, music and drumming for an active session of bonding and giggles. Click on the link to search for local spots offering Zumbini, like Ovation School of Dance and Evolving Artists Dance Studio.